For Old Timer Tuesday, we have one of the oldest vehicles ever featured in the WAI. Name removed. Photo from Don MacKenzie. Never heard of it before but I'll agree on Davidson. I agree it's a 1898 Davidson Steam driven armored car. Agree with Jack. Davidson Steam. Yup, Davidson. Army Colonel Royal P. Davidson began experimenting with motorized scout cars in 1898. 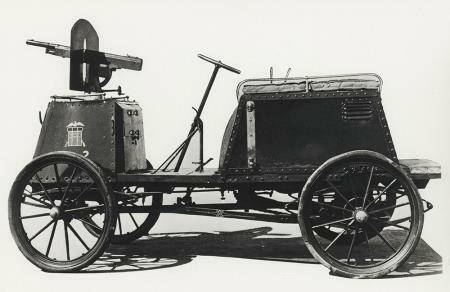 His first two were based on 3 and 4 wheel Duryeas with gasoline engines. His 3rd attempt, and our WAI subject, was this steam powered vehicle built for the Northwestern Military Academy in Highland Park Illinois. Notice this "armored car" provided protection for the vehicle but not for the occupants ! 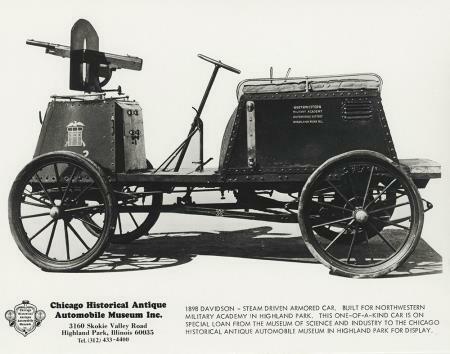 One of the two steam cars Davidson built still exists and is at the Chicago Historical Antique Automobile Museum in Highland Park. Davwingman had this first. Thanks to Don MacKenzie for the photo.